This is easy guide to root Micromax A110 by Bin4ry root tool. I try to make step to step with image tutorial which will make root process easy. Micromax A110 has superb performance. So root your phone, because root allows for you to use a maximum of your phone without any restrictions. After root you can install custom Rom, app and setting in your phone. But first you read Root Advantage and Disadvantage by this post then follow these steps and root your phone. 2. Make sure proper power backup of your PC. Step 2: Connect your phone using storage mode to PC & Install USB Driver Download. If you feel any problem in install driver then watch this video Click here. Step 4: Now pop-up Dos box on your screen with the green letters. Step 5: Type “1” for root Micromax A110 and press enter. If you want to Unroot your phone then type “x” and press enter. Your device will reboot during the process, In this process Bin4ry copy some files in your device. Now your phone rooted. 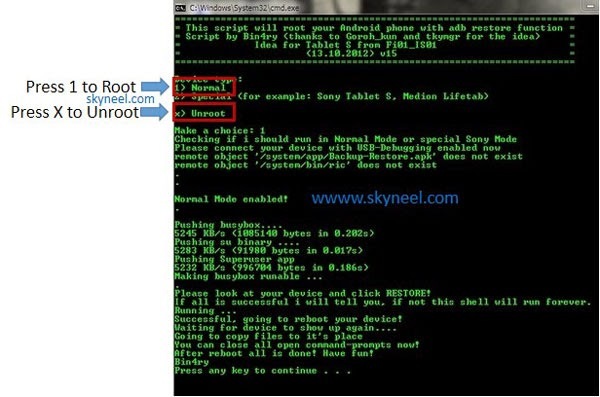 I used Root_with_Restore_by_Bin4ry_v35 on my Xperia Sola and it worked fine with me. after root you will remove some un-necessary app by Micromax and free more Ram. Please press any Key when restore is done. Doing a Backup first, please confirm this on your device! I tried rooting my micromax which is ICS at present. But when I run the RunMe.sh in ubuntu server. I am getting mount permission denied at the very last part after the reboot. I've enabled usb debgging. I saw a similar comment posted by some one in the blog, but not answered well. Could you help me what I am missing here. Tried in windows 7 too by running RunMe.bat, but there I couldn't install drivers well as it was a office laptop. Same was the error there I got. I think the script is not able to copy the super user files to the phone as the root folders on the phone are just read only. Can it be because of the drivers? I doubt whether it works if I fix the drivers somehow. Your kind help would be much appreciated. done thank u….now what ? what can i do plsss rly…. Hello admin please tell me rooting process for A110Q (C2+) ? I tried bin4ary method and some other methods. Super su is installed but but cant open it or any other root app don't work. Please help me yr..
if i keep using jellybean so is it ramain ok??? My rooting error is "the system cannot find the path specified." Bro if you could help me through team viewer or any related software i would be highly grateful. Is this work for sony xperia E? I've been try so many times but it didn't work . .
it is not work in your mobile if you want root your mobile then i will post root guide. I would like to follow your root guide, if you post it already can you give me the link please? no error and root it succesfully. after reboot no superSu found installed. Go to Settings > Development > USB debugging check it. Connect MMX A110 using storage mode on to PC & Install driver. Stop Firewall & Antivirus During root process. Change phone connection to Media device. Unzip the root tool you downloaded by given link. 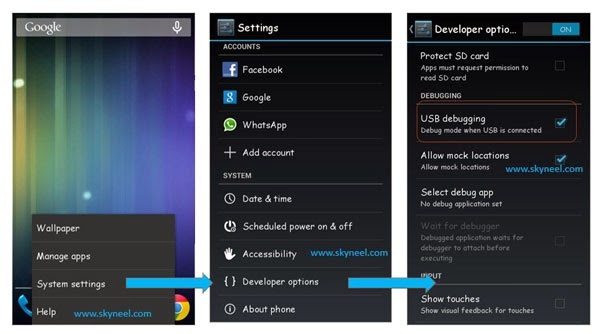 Please connect your device with USB Debugging enabled now ". And after this, it always stucks here and not going further. I`ve tried several times. But it was always the same. Thanks for your reply. Done. I`ve one more question to you. Would you please tell me that what is the best custom rom (ICS or Jellybean) for Micromax A110 with best sound mod and battery backup ? Cynus T2 Jelly bean is best. Well i have MMX A 110 with unofficial JB Cynus T2 update unrooted. I followed the instructions very carefully. After reboot of phone the application tries to mount some partition and it says "Mount Permission Denied" (are you root)". This what i get. if you get "no such file or directory"
I have diectly upadated to jelly bean via stock recovery and sim 2 is nt working..so i want toroot my fone and install cwm on it..bt still having samr prblm..
hello..i m trying to root my fone bt its says,"cant find specific paath"
can you explain same more about your problem? try this step ones more carefuly. 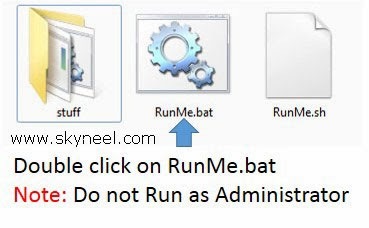 Right Click on runme.bat & Run as Administrator. During of this disable antivirus or Firewall for time. now i am add same more steps i things it is help you.